Hormone Replacement Therapy (HRT) is the administration of hormones for replenishing those patients whose natural hormones are declining in their body. Hormone replacement therapy is generally used for women undergoing menopausal phase. Globally, development of highly innovative drug delivery systems, rise in the number of menopausal women, and increasing awareness on post-menopausal hazards are the prime growth drivers of hormone replacement therapy market. In addition, increase in adoption of anti-aging therapy and newer formulations and, untapped market of emerging economies such as China, India and others will create new opportunities for hormone replacement therapy market. However, higher cost of the therapy and risk of cancer and blood clotting are the key restraints for hormone replacement therapy market. This report identifies the global hormone replacement therapy market size in for the year 2014-2016, and forecast of the same for year 2021. 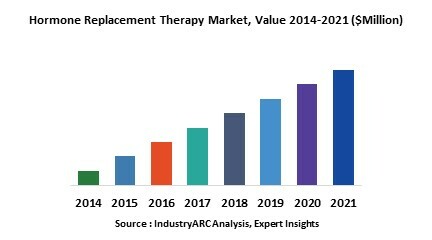 It also highlights the potential growth opportunities in the coming years, while also reviewing the market drivers, restraints, growth indicators, challenges, market dynamics, competitive landscape, and other key aspects with respect to global hormone replacement therapy market. Geographically, North America dominates the hormone replacement therapy market, and Asia Pacific is projected to have the fastest growth, owing to rapidly increasing aging population, growing awareness on symptoms and availability of therapies and modernizing healthcare infrastructure in developing nations such as China and India in this region. Among all the products, estrogen replacement therapy has the highest market share in the hormone replacement therapy market. 10.1. Abbott Point of Care, Inc.
10.5. Hisamitsu Pharmaceutical Co., Inc.